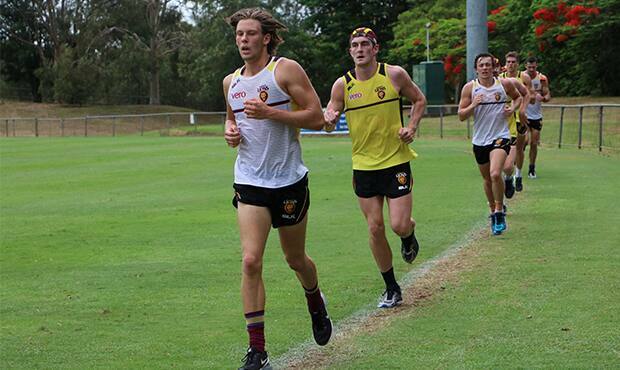 Josh Clayton leads the pack at pre-season training. The Brisbane Lions have re-signed another member of their 2014 draft class with Josh Clayton extending his stay at the Gabba until at least the end of 2017. Clayton, the son of former Fitzroy player Scott Clayton, joins Harris Andrews and Jaden McGrath in inking a new deal despite a year still to run on his contract. The 19-year-old began his first year of development playing for the Lions in Reserves. It was his versatility that was his greatest asset throughout the season, taking up a number of roles as the Club attempted to deal with a growing injury list. "It's a fantastic result to have Josh re-commit to the Club," said Brisbane Lions General Manager of Football, Matt Francis. "We look forward to seeing a player of his talent continue to grow and develop."